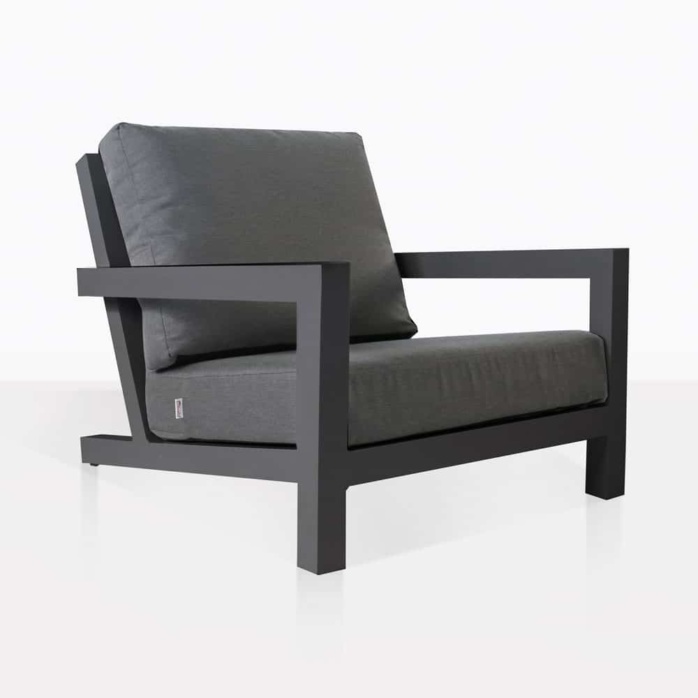 The culmination of incredible artistry and superior construction is present in the divine new Granada Outdoor Club Chair in Coal, a piece that is comfortable, versatile and supremely stylish. Part of the memorable Granada Outdoor Aluminium Furniture Collection, available in Coal or white, the Granada Club Chair sings of luxury, opulence and urban sophistication. Sleek, simple and sophisticated, our Granada Outdoor Club Chairs feature a brilliant collaboration between classic style and modern materials. The angled back, low and wide seat reminds us of a classic Adirondack chair but with the use of incredible contemporary matte coal aluminium and cushy, luxurious Sunbrella® cushions, this is a style to be reckoned with! Slick and versatile, Granada suits many spaces, and styles of home! Invigorate your outdoor area with the Granada Outdoor Aluminium Club Chairs. Set two of these gorgeous chairs on either side of the Granada Outdoor Sofa and place a Granada Coffee Table between for a cohesive, sleek and well put together look. Adding in a cantilever umbrella, some side tables and pot plants will make this area a welcoming, gorgeous space for you to enjoy relaxing in! Perhaps your apartment is in need of some freshening up. A balcony space will be given new life with one or two of the Granada Club Chairs with an attractive side table to finish off the look and give you space to unwind in style and grace. Constructed from ultra durable powder coated aluminum, the Granada Collection gives you license to relax in style and luxury without the worry of corrosion! Our products have minimal maintenance to take the fuss out of outdoor furniture! We care about your relaxation and transforming space into something that reflects your taste and lifestyle. We have the greatest range, styles and materials for outdoor furniture! Call Design Warehouse today to order your Granada Club Chair in sleek Coal, allow yourself to impress upon luxury!